Here are the most frequently asked questions I get about issues with the Yousmle Anki cards. Alternatively, the other most common issue is that people don’t decompress/unzip the file. Did you make sure that you unzipped the file before you try to import it on the desktop application? If you’re not able to decompress the file, often times it’s because for some reason some computers download the file without the proper file extension (e.g. they download it as something like “Yousmle” rather than “Yousmle Step 1 Deck.zip”). If you change the extension to something like Yousmle.zip, you should be able to decompress it properly. I can’t open my cards on my iPhone/mobile device. Why are there only ~300 questions? Weren’t there supposed to be 1200+? 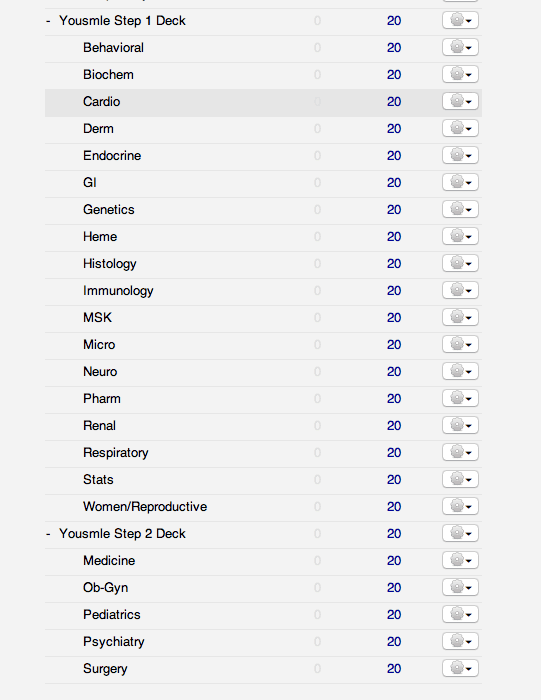 Anki defaults to only 20 NEW cards/day, so it will only show you the 20 FIRST cards in any given section when you upload the deck. Whenever you try to upload the deck now, it probably says that zero cards were updated, which is because you have already successfully uploaded the deck. Now, all you need to do is change the default settings, and the number of new (displayed in blue) cards will automatically go back to whatever you set the default to be the next day. Why are there questions right below the answer? You may have already noticed that there is often a question right below the answer. This is intentional!! In Anki there is an option to create questions with an optional reverse. Note that there are three “fields” (spaces) here to enter information. In the “Front” field, I’ve put the question in, “Plasmodium – treatment (2)”. In the “Back” field, I’ve put the answer. However, Note how there is ALSO a question there, “Organism?” If it doesn’t look like it’s a part of the answer, it’s not! It is, in fact, meant for the “reverse” card. If I put a “y” in the “Reverse” field, it signifies that I want to create a reverse card. What is a reverse card? 1) It allows you to test the information in BOTH directions (e.g. you not only have to know that the treatment for Plasmodium is chloroquine, and that you add primaquine for the dormant liver forms – they LOVE this question on Step 1, by the way – but you ALSO will be tested on knowing that Plasmodium is what is treated by chloroquine/primaquine. There is no way to predict what “directIon” these questions will show up on your best, and so testing yourself in BOTH directions can help you to improve your understanding of these concepts. 2) It makes making any changes to the cards more easily. For example, if I were to create two separate cards, one for each direction, but then the treatment changed for Plasmodium (which it very well could), I would only have to make the changes in my cards once, and it would be changed in both cards, since they are both created from the same set of information.